As of Tuesday night, Ticketmaster only showed the new dates for Belfast and Dublin, but their listings should be updated soon, and they are likely the ones to contact for ticket exchange information. Thanks! Halos & Horns holds on to the top spot on the British country albums chart for a third week in a row, it was announced Sunday. The CD also slips one place to No. 15 on the independent label albums chart and falls off the top 75 pop albums chart, down from No. 52. In the same edition, Little Sparrow climbs one spot to No. 8 for its 74th chart week on the country albums chart overseas, and The Grass Is Blue moves up two places to No. 13 for its 22nd chart week. A couple of new glowing reviews of Halos & Horns have also been released. Country Review calls it one of the best albums of her career and notes that country fans will love "Stairway To Heaven," although rock fans may consider it sacrilege that she changed the lyrics (which he was quick to point out had been approved by Led Zeppelin). Read it here. And Dallas gay newspaper The Dallas Voice gives it three and a half stars, saying that Dolly "just doesn't get the credit she deserves." Gilbert Garcia praises the CD for its creative originals and amazing covers surmising: "Though not a perfect work, this album is certainly good enough to make you realize that Dolly's still got it. Sounding more like the work of a poor girl from Tennessee than of a rhinestone-clad superstar, Halos & Horns is simple, welcoming and pleasant — exactly what a country album should be." Read it here. Dolly, the new CD and the tour showed up in several places over the past few days including a USA Today feature on Tuesday (here), a San Francisco Gate editorial (here), MSNBC's gossip column (here) and a Tennessean mention of her duet with Dottie Rambo (here). Dottie Rambo's appearance on WSM's Opry Star Spotlight on Friday night to premiere her new duet with Dolly, "Stand By The River," went extremely well. In fact, the host so liked the song that he played it a second time immediately after its premiere. Dolly's sister, Stella, dropped by to talk about Dottie and Dolly, saying that Dottie is the greatest gospel songwriter of all time and Dolly is the greatest country songwriter of all time, so a collaboration between the two is very special. Even former President George Bush Sr. and his wife, Barbara, called in to tell Dottie they were listening. If you'd like to request the song, visit WSM's website here. Another reader offered his thoughts on Dolly's Atlanta show from Thursday night, saying quite simply: "It was awesome!!!!" He estimated that the audience largely consisted of gay and lesbian fans, with even a few transsexuals and drag queens thrown into the mix, prompting Dolly to change the line in "Jolene" to sing: "Drag queen, please don't take my man." Also, an article may soon appear on the show in Rolling Stone, as the reader said he stood next to a reporter from the magazine covering the show. Thanks, Jonathan! An Atlanta Journal-Constitution article in Saturday's paper about personal chapels included a mention of Dolly and her chapel in her Nashville office complex, where she kneels before an alter beneath an adobe cross each morning. " This is where I do my spiritual work," she told the newspaper. "I've built one in all my homes and offices, and it's where God speaks to me and where I can talk to God." The article also mentioned that the room features glass walls etched with seven angels. Read the story here. There will be no Dollymania updates on the evenings of July 28 and 29, as your webmaster will be in New Orleans covering Dolly's sold-out House of Blues concert there Monday night. Look for a recap and photos here, likely by Tuesday evening. And if you're attending the show in the Big Easy, remember The Bourbon Pub (801 Bourbon Street in New Orleans) will be hosting the official "Pre-Dolly Party" and CD release event from 9 p.m. until 11 p.m. on Sunday (this is a predominantly gay establishment). The Times-Picayune in Friday's edition published a great article on Dolly in advance of her concert. It was the cover story for the paper's weekend section and featured a Dolly career time-line based largely on information gathered from Dollymania. Read the story here (unfortunately, the time-line was not published online). A reader who attended Dolly's sold-out Atlanta show on Thursday night reports that Dolly was "flawless," looking and sounding better than ever. However, the evening was not without problems, he says. Allegedly, dozens of concert-goers had their cameras and/or film confiscated by security. The reader who contacted Dollymania said security claimed small signs were posted at the entrance reading "No Pictures," but he didn't see them and no announcement of this was made when attendees, many of them carrying cameras, entered through the ticket line. He said hundreds of people were snapping photos and that security managed to catch about 30 of them. Thanks, Bix! A special thanks to Justin Frazier for some photos of Dolly performing in Atlanta on Thursday (here) and Debbie Poole for some shots of Dolly arriving from her tour bus before the show (complete with a commentary about the evening here). Thanks, guys! Friday's Christian Science Monitor offers up more praise for Halos & Horns, with reviewer Vic Roberts saying the CD is "a good buy" for anyone who enjoys bluegrass instrumentation and Dolly's voice. He termed the songs "simple, teary-eyed laments of relationships turned bad" mixed with spiritual numbers, including her cover of "Stairway To Heaven," of which he said her "acoustic approach does it justice." Read the full review here. For some reason, my online source for the Canadian albums charts didn't update their listings last week, but Halos & Horns, which debuted at No. 21 up north last week, moves up three places to No. 18 for its second chart week in the July 25 chart released Friday. It has yet to break into that nation's top 100 pop albums chart, which currently includes only a couple of country releases. And I've just learned that Dolly also shows up on the Roots Music Report, which compiles its own charts of roots music based on worldwide radio airplay, sales and reviews as reported by radio stations, record stores, concert venues and key music correspondents covering roots music. Halos & Horns moves up an astonishing 57 places in its third week on their bluegrass chart to No. 1 and shoots up 46 spots on their overall roots music chart to No. 12 in its second week. For those who haven't seen Dolly's amazing video for the first Halos single, "Dagger Through The Heart," here's the broadcast schedule through this weekend on the two major country cable networks. The video will have its Great American Country (GAC) premiere on its Fast Forward program at 7:30 p.m. Eastern on Friday. It will repeat at 12:30 a.m., 8 a.m. and 3 p.m. Saturday; 2 a.m., 8:30 a.m., 12:30 p.m., 7:30 p.m. and 10:30 p.m. Sunday; and 11:30 a.m. Monday. On CMT, where the video premiered last weekend on Most Wanted Live and is getting very limited showings, it is scheduled to air at 2:30 a.m. and 8 a.m. Saturday , 6:30 a.m. Sunday and 12:30 a.m. Monday. Vote for the video at GAC here and CMT here to get them to air it more frequently! Gospel legend Dottie Rambo's management has confirmed that her new duet with Dolly, "Stand By The River," will have its broadcast premiere on Friday night's Opry Star Spotlight on WSM radio (available online here). The show airs immediately after the Grand Ole Opry show (which comes on at 9:30 p.m. local time, 10:30 Eastern), and I understand that Dottie is scheduled to be on the program close to its start. Thanks! Sunday's Dallas Morning News will feature an interview with Dolly about the new album, her tour and her Aug. 2 stop in the "Big D." The story was posted on their website here Friday night. Along with giving praise for the new CD, the writer asks Dolly about the song choices, her tour, and more. It also notes that the Dallas show is sold out (something reported here a good while back), although House of Blues still hasn't officially titled it as being sold out yet. Billboard released its Aug. 3 charts on Thursday, and Dolly's Halos & Horns debuts at No. 2 on the bluegrass albums chart (suggesting that this chart is a week behind the others the magazine publishes, because the CD debuted on all other charts last week). Unfortunately, two other Dolly recordings, Little Sparrow and Ricky Skaggs And Friends Sing The Songs Of Bill Monroe (which features her cover of "Cry, Cry Darlin'") fall off the bluegrass chart, down from No. 12 and No. 11, respectively. Halos slips five spots on the country albums chart but remains in the top 10 for its second chart week, coming in at No. 9. On the independent albums chart, it falls two places to No. 5, on the Internet sales chart down 13 spots to No. 24, and on the pop albums chart down 45 notches to No. 103. It is also in its second week on all of those charts as well. The CD Soundscanned nearly 12,000 copies in its second week of release, on which these charts are based, down from about 19,000 in its first week but still strong sales. Harrell and Patric sent in some great photos of Dolly in Nashville (like the one at left) at Most Wanted Live, The Grand Ole Opry and in concert at the Ryman. View them here! Thanks, guys! The Associated Press reported Wednesday that Silver Dollar City Corp., which is Dolly's financial partner in Dollywood, the Dixie Stampede theaters and Dolly's Splash Country water park, is building a $40 million amusement park in Branson, Mo., where they already co-own a Dixie Stampede with Dolly. The new park, called Celebration City, will not be associated with Dollywood. The park will feature several rides based on life-changing events of the 20th century. Read it here. Dolly's critically-acclaimed stage show for her "Evening With Dolly Parton" Halos & Horns Tour rolls into Atlanta Thursday for a sold-out show at Earthlink Live. Anyone attending who would like to submit photos and their recap of the show is encouraged to e-mail them here. Any submissions would be greatly appreciated! And if you haven't gotten your tickets yet for the handful of yet-to-sell-out dates for her tour, do so here now! Big D & Bubba themselves tell me that Dolly's phone appearance on their syndicated radio program has moved to Thursday morning, not Wednesday as was originally scheduled. The show originates out of WNYK in Baton Rouge. Once again, Dollymania contributor Debbie Poole has provided some great Dolly shots like the one at left! Exclusively on the site you may view her great pictures of Dolly on the stage at the Grand Ole Opry last weekend plus a couple of pics from her Most Wanted Live appearance on CMT. Click here to take a look! (And also view her photos from Dolly's recent New York appearances here; you'll recognize her as one of the horn-wearing fans.) Thanks, Debbie! Country music cable network Great American Country has announced its premiere date for Dolly's "Dagger Through The Heart" video, which CMT started showing over the weekend. The video will be first shown on the network's Fast Forward program on either its 7 p.m. Friday or 3 p.m. Saturday broadcast (Eastern time). And everyone needs to visit their voting booth to cast a ballot for Dolly here (and CMT's here)! People magazine chose a classic Dolly line which she repeated on The View recently as the Quote Of The Week for its July 29 issue: "People say, 'Are you offended by the dumb-blonde jokes?' And I say no, because I know I'm not dumb and I know I'm not blonde." Thanks, Hartman! CMT.com's daily poll on Tuesday asked readers to pick which Dolly song was their favorite. As of early Tuesday evening, "I Will Always Love You" led with 43 percent, followed by "Coat Of Many Colors" at 19 percent, "9 to 5" at 16 percent, "Jolene" at 15 percent and "Shine" at 7 percent. Dollymania contributor Debbie Poole tells me that Dolly's Nashville appearances on Saturday and Sunday were as spectacular as ever. She reports that her tour merchandise was "selling like hotcakes" and that Dolly "was pouring out the songs and the people were with her all the way clapping and singing." Look for photos from Debbie here soon, most likely in Tuesday evening's news update. Thanks, Debbie! The Tennessean and CMT.com also on Monday posted their rave reviews of the show. CMT's Craig Shelburne reported that Dolly received a standing ovation when she entered the stage, and she even orchestrated an onstage marriage proposal between two members of her band: Randy Kohrs and Shaunna Larkin. (She said yes.) He said called "Color Me America" "a understated yet rousing reminder that peace should not be taken for granted" and said she should record it. He concluded that Dolly's "bold vocals and easy stage presence throughout the concert proved that those sparkling high heels have not missed a step in the last decade." Read his review here. Peter Cooper, writing for The Tennessean, was equally as complimentary, praising her show (although he said there were some sound problems) and comparing her onstage presence with that of Shaquille O'Neal on the basketball court. He summed it up saying, "In the end, she left nearly everyone in the room wanting more, as she declined an encore and managed to appear both graceful and gracious even as she told the audience to leave and 'go pee.'" Read his review here. The only real changes in the set list from her most recent show (D.C.) were the return of "Color Me America" and "My Tennessee Mountain Home." The Detroit News gives it three stars and calls it "worthwhile," with reviewer Brian Fisher noting that "Stairway To Heaven" is "surprising, but satisfying" and that rock purists may find it sacrilegious, but the song proves that her "voice has never sounded so sweet or heaven-sent." Read his full review on the paper's site here. And The Week Magazine names it this week's "best pick" in all of music. And while Chicago's Daily Southtown only gives it two and a half stars (the reviewer didn't care for "Stairway To Heaven" or "Hello God"), its review notes that most of the songs on the disc are good "real" country music, singling out the "catchy" "Sugar Hill" and "refreshing" "If." Read it here. The end-date is nearing for House of Blues' contest to win a trip to Vegas to see Dolly live on Aug. 10. If you haven't yet entered, you have only until Friday to do so. Enter here (where you can also buy tickets to the few emaining dates of her summer tour which haven't sold out yet -- better hurry!). And Dolly showed up in another article in Monday's Tennessean. In a feature on former Hee Haw star LuLu Roman's new line of Southern food, it was noted that she sent some samples to Dolly, who thought they were so good that she ordered them to be stocked at Dollywood. The article says the snacks should be on sale at the park in a couple of weeks. Read the full story here. No. 1 Again, Plus Three In Top 15! Halos & Horns holds on to the top spot on the British country albums chart for a second week in a row, it was announced Sunday. The CD also slips three places to No. 14 on the independent label albums chart and 15 notches to No. 52 on the pop albums chart. In the same edition, Little Sparrow climbs one spot to No. 9 for its 73rd chart week on the country albums chart overseas, and The Grass Is Blue returns to the chart, coming in at No. 15 for its 21st chart week. Asgard, the company promoting the European leg of Dolly's current tour, has confirmed to Dollymania that the Oct. 19 concert in Belfast first reported in the U.S. here Friday night is the show which had been scheduled for announcement on Monday. No word on why Ticketmaster jumped the gun and posted it before that time. Tickets are scheduled to go on sale Aug. 2, I'm told. Thanks, Paul! Worchester, Mass., paper Metro West Daily News gives it an "A," writing that the CD allows Dolly to offer up a wide range of amazing performances: "Some are giddy, some are deeply sad, some share her strong sense of faith." Also, it is noted that her cover of "If" is "warm" and "Stairway to Heaven" "stays remarkably true to the spirit of the original." Read it here. The Nashville Rage music site calls Dolly "the white Aretha Franklin" because of her amazing voice and the fact that she is so authentic in her music that "if she sneezed she's spray the room with soul." Reviewer Robert L. Doerschuk further even compares her voice to a country version of Luciano Pavarotti. While he says that some of her choices on the album are of "questionable taste" (such as covering "Bread's gooey 'If'" and doing the mountain woman impersonation on "These Old Bones"), a listen through each song in its entirety proves them to be winners. He writes: "Maybe the best thing to happen to Dolly Parton was when she became an outcast from a music business she had helped kick-start and dragged out of its Dogpatch doldrums. Her work on Sugar Hill, and especially on Halos & Horns, comes from her return to the wellspring - not to wallow in it, in the fashion of O, Brother, but to savor it again and drink more deeply and let it flow down into her music, and from there out to the world and into this studio where I sit, a bit of my faith restored at long last." Read the full review here. And the Cape Cod Times offers three out of four stars, noting that "I'm Gone" is "infectious and high-spirited" and that "Dagger Through The Heart" is "wistful," although the reviewer wasn't very fond of "Hello God" and the album's two cover songs. Read it here. Plus, the CD over the weekend reached No. 1 on the country albums sales chart of Tower Records.com. Thanks, Chad and Lynette! Although I have yet to see it since my cable company removed CMT from the line-up and I had to have someone record it for me, I'm told Dolly was as bubbly as ever on Most Wanted Live, where her new video for "Dagger Through The Heart" premiered on Saturday. Then on the Grand Ole Opry she performed part of "Halos And Horns" and all of "Coat of Many Colors" and "Dagger Through The Heart." She was also presented with a special award from the Opry manager. Thanks, Jaron! Request the video on CMT here! Dolly fan and frequent Dollymania contributor Greg K. has provided some more great photos of Dolly from her New York CD signing, where he was the first in line to get the wristband for admission. Read his touching recap and see the great photos here. Thanks, Greg! The Seattle Times on Sunday published a great Knight Ridder syndicate article on Dollywood, including an interview with Dolly and overview of the park's offerings. Read it here. I finally got a hold of the track listing for Federal Records' The Best Of The Best: Hall Of Fame Dolly CD. The tracks are: Coat of Many Colors, My Tennessee Mountain Home, Just Someone I Used To Know (with Porter), Just Because I'm A Woman, In The Good Ole Days, In The Ghetto, Jolene, Daddy, My Blue Ridge Mountain Boy and Holding On To Nothing' (with Porter). Ticketmaster.com on Sunday began showing no tickets available for Dolly's Aug. 13 Denver concert, suggesting it has or soon will be sold out. Also, while House of Blues has not officially announced her Aug. 3 Dallas show is sold out, I have confirmed that no tickets are available either from Ticketmaster or the venue itself, meaning that the show has sold out. The tour dates which have officially sold out have been New York, Washington, Nashville, Atlanta, New Orleans, Los Angeles, Chicago and Kansas City. Dates with tickets still available are Aug. 10 in Las Vegas, Aug. 21 in Lowell, Mass., and Aug. 28 in St. Louis. Get tickets here! Emmylou Harris' 1980 classic Roses In The Snow, which features Dolly and Ricky Skaggs singing harmony on "Green Pastures," has just been released on CD. Get your copy here! Her European tour earned her a mention in Friday's edition of Billboard online. Read it here. Remember Dolly appears on CMT's Most Wanted Live at 7 p.m. Saturday, followed by her appearance on The Grand Ole Opry Live, which airs on the network at 8 p.m. Eastern. Tickets are still available through Ticketmaster for the Opry show, which will be hosted by Mike Snider and also feature Joe Nichols, the Stevens Sisters, Kevin Welch and Elizabeth Cook. And then there's her sold-out concert at the Ryman Auditorium in Nashville on Sunday. (Anyone who attends and wishes to send in a report, please e-mail me here! Thanks!) P.S. Her video for "Dagger Through The Heart" is scheduled to be shown on CMT at 2:30 a.m., 7 a.m. and 4 p.m. Eastern on Monday and 12:30 a.m. Tuesday. AOL is offering a free Real Video version for viewing here. And her Nashville appearances this weekend gave her a prominent interview in the city's Tennessean newspaper on Friday. In the article titled "Mother To The Music," she talks about the album and the tour, while writer Craig Havighurst offers some of his positive opinions about the new CD. Dolly comments: "What this album turned out to be and what I had hoped is some of everything that I have ever been and what I am. Because not only did I take some songs of old and rework them, I did some new songs that sounded like they were old. I love that solid hard-country sound, but it took me all the way back to my early days in Nashville. The gospel influence has always been a part of me, and I wanted to bring that in.'' Read the full story here. The Orange County Register on Friday gave Dolly's Halos & Horns another "A-" with its review. The reviewer notes that her cover of "Stairway To Heaven" effectively "saves the rock classic from decades of ridicule" just as she transformed Collective Soul's "Shine" into "a bluegrass marvel." The review further discusses the religious themes found throughout the CD and concludes that it "is primo Parton, her chirping voice as heavenly as ever, her style restored to its pre-'9 to 5' manner." Read the full review here. Reserve your copy of Pam Tillis' Sept. 3 release It's All Relative: Tillis Sings Tillis, in which Pam and many of her friends, including Dolly, perform some of father Mel's greatest songs. Get your copy here! Just two weeks after his wonderful article titled "Let Us Now Praise Dolly Parton" cheering her new CD (here), CMT.com editorial director Chet Flippo once again focuses on Dolly in this week's installment of his Nashville Skyline column. In Thursday's new edition, he notes that Dolly's debut at No. 4 should have bluegrass fans cheering with further proof of the resurgence of bluegrass as a popular form of music. He continues to discuss the genre's prospects and the impact that non-airplay on mainstream country radio has. Read the full article here. An additional date is scheduled to be announced on Monday, which I would suspect will be the possible Northern Ireland concert which has received press overseas lately. Tickets went on sale Wednesday for the London shows and Thursday for the Glasgow show on Ticketmaster UK (tickets are also available for both cities on Ticketmaster Scotland). Tickets also went on sale Thursday for the Manchester show on the venue's web site here, and tickets for the Dublin date will go on sale this Saturday on Ticketmaster Ireland. The tour marks Dolly's first full concerts in England or Ireland in nearly two decades, according to an Asgard press release. Manchester Online carried an article about the show in that city here, including a note from a theater spokesman that they don't expect tickets to last very long. Thanks! Dolly ends up getting press in two locations on this week's Nashville Scene, Music City's alternative weekly newspaper which was published on Thursday. In their "Best Picks" of the week (here), they chose Dolly's sold-out Sunday concert at the Ryman Auditorium, noting that she's "just released her third terrific album of mountain music in a row." Also, Bill Friskics-Warren's "Voices Of Reason" column compares rapper Chuck D's "A Twisted Sense of God" and Dolly's "Hello God" with interviews from both stars about their songs and questioning fanatics who commit violence in the name of God. Read it here. See a gallery of several Dolly pics from her appearance earlier this week on John Boy & Billy's The Big Show here. I haven't seen it yet, but I'm told that the Aug. 6 issue of Country Weekly has a two-page article on Dolly! Thanks! Sugar Hill Records has confirmed that Dolly's Halos & Horns will debut at No. 58 pop and No. 4 country on the July 27 Billboard charts which will be released publicly on Thursday afternoon. The album sold 18,654 in its first week to bring Sugar Hill and its parent company, Welk Music, its highest-ever chart debut. No word yet on where the CD will be on the magazine's independent label albums chart or Internet sales chart, but I'd expect it to be near the top for idies. As was reported here, the debut gives Dolly the new record for most country albums in the top 10 with 40, followed by Loretta Lynn and Merle Haggard with 39 each. Thanks, Rob! Tickets went on sale Wednesday morning on Ticketmaster UK for two Dolly concerts this fall overseas. The shows will be held Oct. 22 and 23 at London's Carling Apollo Hammersmith. And given that Halos & Horns debuted there at No. 1 on the country charts and Little Sparrow is still in the top 10, I'd expect the shows to sell out quickly even at a hefty 50 pounds each for tickets. She is expected to play at least three additional cities on the islands this fall: reportedly Glasgow, Scotland; Dublin, Ireland; and one in Northern Ireland, possibly Belfast, but Ticketmaster UK, Ticketmaster Scotland and Ticketmaster Ireland were not showing any of those dates as of yet. Thanks, Manuel and Mark! And speaking of sold out venues, two additional dates on Dolly's summer U.S. tour have officially sold out, House of Blues confirmed Wednesday. They are the Aug. 17 concert in Chicago and Aug. 31 in Kansas City. Tickets are still available from Ticketmaster.com for Las Vegas, Denver, Lowell and St. Louis (plus her Grand Ole Opry performance on Saturday), but Dallas still is showing none available from Ticketmaster.com, so it should be officially sold out any day now. Get your seats here! The Washington Post has weighed in with its review of Dolly's Monday night concert in D.C. Reviewer David Segal said "It would take an engineer and plenty of graph paper to explain the wonder" of how good Dolly looked onstage and that her looks are a good metaphor for her amazing talent, which too seems impossible to comprehend. He praised her memorable performance of otherwise easily-forgettable rock songs like "Shine" and "If" and said the evening's showcase was when she performed her original compositions, which prove she is one of the greatest country songwriters of all time. Read his humorous and praising review here. Thanks, Hans! Frequent Dollymania contributor Debbie Poole was kind enough to provide a couple of photo layouts of Dolly from her New York appearances. You'll recognize Debbie and her pals as the fans donning horns on their heads during each of her stops in the Big Apple. They tell me they found them at an Independence Day fireworks stand and couldn't resist. Dolly found them so appropriate that she called them aside to talk with them and have a photo taken. Take a look at more photos here. Thanks, Debbie! Dolly's general admission, standing room only show at Washington's 930 Club proved a huge hit, judging from audience reaction I have received. Major changes from her New York show included the apparent accidental omission of "My Tennessee Mountain Home," removal of "Color Me America," and the addition of an early-years silly songs medley with "I Don't Want To Throw Rice," "He's A Go-Getter" and "I'll Oilwells Love You." As in New York, cameras were not allowed in the sold-out show. Some thought the choice of locations was a bit odd, as the club is located in a not-so-great neighborhood in D.C. Still, the audience of about 1,000 covered all types, from teen-agers to seniors, gay and straight. Just four or five people were already in line for admission by 2:30 p.m., growing to about 20 eager by 3 and to a two-block-long line by 5:30. By 7, the line was about 400-long, and it had reached about 500 (roughly half the audience) when the doors opened at 7:30. The Blueniques took the stage for a couple of songs at about 8:50, with Dolly entering at 9 p.m. sharp wearing a baby blue V-neck dress. She concluded her set at about 10:30 p.m. Fans commented on the "magic tricks" Dolly accomplished with her voice, from ripping into "Shine" like her life depended on it to hitting an amazingly high note with crystal clarity on the coda of "Smoky Mountain Memories." The only criticisms I've heard were that Dolly didn't play the wah-wah guitar very well on "If" (she even said to the crowd, "My wah-wah ain't too good, is it?") and the piano which came in on "After The Goldrush" sounded out-of-place compared to the rest of the show. As in New York, some fans said they were again disappointed that she simply ended the show with "I Will Always Love You" instead of her traditional leaving the stage before that song and returning for an encore of her signature classic, but others said they don't mind the change. It was also noted that Dolly used a teleprompter from which to read song lyrics throughout the show (but she's done this regularly for several years now, as most performers do now-a-days). Regardless, the audience was crazy for her and what was described as a nearly flawless performance. Many times, she appeared overwhelmed by the thunderous applause, it was reported. All in all, everyone seemed more than pleased with the night, with one fan even commenting "It is the best money I had ever spent in my life!" Randy Kohrs "Little By Little"
House Of Blues confirmed on Tuesday that Dolly's July 29 New Orleans concert has officially sold out. Apparently a handful (and I mean a "handfull") of tickets may remain for the Dallas, Chicago and Kansas City shows, but you'd do best to contact the venues directly because Ticketmaster.com is not allowing online sales for those dates as there are so few tickets remaining, if any. Order tickets for her the other remaining shows in her summer tour here. According to Sugar Hill Records, Dolly will do several interviews in coming days to promote the new album and tour. She will visit with WPLY Y-100 in Philadelphia via telephone at 9:20 a.m. local time (Eastern) on Wednesday, followed by a phone interview with KCKK in Denver at 8 a.m. local time (Mountain) that same day. On Thursday, she is scheduled for an 8:35 a.m. local time (Central) phone interview on WZNY Y-105 in Augusta, Ga. On July 24, she'll chat by phone at 9 a.m. local time (Central) with Big D & Bubba on their syndicated show from WNYK in Baton Rouge. She'll do in-person interviews on Aug. 6 at KZLA in Los Angeles (7:45 a.m.) and with Rick Dees in Burbank on Aug. 8 (8:45 a.m.). She also appeared on the John Boy and Billy "Big Show" live in the studio in Charlotte, N.C., on Tuesday. Thanks, Rob! The Village Voice in Wednesday's edition will feature a review of Dolly's New York concert from last week, posted Tuesday evening on the paper's web site. Carla Spartos noted the religious themes of the evening and how Dolly's current music could well put her back on country radio. She also wrote of Dolly playing multiple instruments during the concert and her abundance of bawdy humor. She said the audience -- "alt-country hipsters in cowboy hats, countrified lesbians, older gay men from the South, a rumored Debbie Harry and Bjork" -- loved it. Read her review here. The Arkansas Democrat-Gazette on Sunday joined the list of the dozens of newspapers, magazines and other media outlets praising Halos & Horns. Reviewer Ellis Widner gives the CD an "A," noting that her version of "Stairway To Heaven" will take the listener's breath away. Thanks, Robert! After several readers contacted me to say they were unable to download the Dolly Microsoft Media Player skin, I got in touch with Sugar Hill Records. Apparently, a file included in the download was corrupted, causing the problems. It has been corrected, and the skin is now available here. Thanks, Rob! A fan who attended the New York show asked me to note that he ran into Dead Kennedys lead singer Jello Biafra at the concert, who said he found out about the show that morning while in town for a conference and just had to find a ticket to get into the sold-out venue. Apparently getting a ticket from a scalper, he told the reader that he gladly paid the highest price he ever had in his life for a concert but got to see Dolly. Thanks! Shirley Jinkins of the Ft. Worth Star-Telegram gives Halos & Horns three out of four stars, noting: "OK, it's going to be scary when you notice that the final cut of this primarily acoustic, rootsy album is 'Stairway to Heaven,' but hang with it. Banjos and mandolins really do work on the Led Zeppelin signature." She also notes that the CD contains some "excellent new bluegrass tunes" and that "John Daniel" is a "gospel romp." She concludes: "It's invigorating to hear one of country's veterans get back to the high-lonesome mountain sound that first charmed her fans." Read the full review here. Already No. 1 in England, Dolly's new CD should debut very high on the U.S. charts as well, preliminary sales data shows. With about 55 percent of retailers reporting, HITS Digital Ventures showed early sales figures on Monday evening of nearly 14,000 units sold. If these numbers hold as the remaining retailers return their information, the CD will have moved about 25,000 copies in its first week of release. That number would place it on the pop albums charts around No. 50 and the country albums chart around No. 3. U.S. charts will be released by Billboard on Thursday. 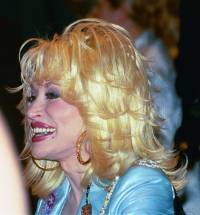 Dolly's most recent venture into the pop top 50 was 1993's Honky Tonk Angels with Loretta Lynn and Tammy Wynette. Her most recent entry into country's top 10 was 1999's Trio II with Linda Ronstadt and Emmylou Harris. Both of those CDs went gold in the U.S. If she breaks the country top 10, she will hold the record for the most top 10 albums on the country chart with 40 total. She currently is tied for first place with Loretta Lynn and Merle Haggard at 39 each. Dolly and her Halos & Horns made the Voice of America news on Monday. Read Mary Morningstar's report here. The July/August issue of bluegrass and alt-country magazine No Depression features a full-page ad for the CD. Thanks, Jim! Dolly has scheduled a Sept. 4 concert it Sioux City, S.D., as a fundraiser for the new statewide expansion of her Imagination Library, it has been confirmed. Although an article in Tennessee's Mountain Press on Friday mentioned the show, no South Dakota newspapers or television stations covered the announcement in their online editions until tickets went on sale Saturday at the 2,000-seat Washington Pavilion of Arts and Science's Great Hall. According to a South Dakota reader who e-mailed me Saturday afternoon after he had just found out about it, the show was supposedly announced on Tuesday, and word of mouth got South Dakota fans camped out at the box office on Friday night, with tickets selling out in about seven hours. A brief mention on local television station KSFY's site on Saturday said proceeds from the concert will match funds that each of the state's local United Way chapters raise for the first statewide effort for the Dollywood Foundation program which provides one free book each month to all children in participating communities from birth to age 5. Thanks, Mike! 'Halos' Debuts At No. 1! Dolly's spectacular Halos & Horns debuts at No. 1 on this week's British country albums chart, it was announced on Sunday. The CD also comes in at No. 11 on that country's independent label albums chart and No. 37 on its Top 75 pop albums chart. In the same edition, Little Sparrow, now in its astonishing 72nd chart week overseas, falls two places to No. 10 on the country albums chart. The Grammy-winning Sparrow last year spent eight weeks at No. 1 and reached gold album status in England. It had also peaked at No. 30 on that nation's pop albums chart and No. 4 on the independent label albums chart. John Horney of the Annapolis Capital offered a mixed review of the CD on Sunday. About Dolly, he writes: "There's something extremely comfortable about listening to Dolly Parton sing. That may seem odd considering the artist's catalogue of hits includes stories of dead babies, heartbreak, little homeless girls and their dogs, crazy backwoods characters and home-wreckers. But still, she has a way of singing and telling a story that makes you feel like you know her, as well as the characters in her songs, on a first name basis and that she's singing these songs on your own front porch. This is my favorite Dolly Parton-the storyteller, the songwriter, the mountain raised country girl who talks like she's your best friend." He explains that this simple yet compelling performance has been most apparent on her last several CDs, calling The Grass Is Blue and Little Sparrow "jewels in the crown of a tremendous career." On Halos, he said he finds most of the CD, especially cuts like "These Old Bones" and "Not For Me," gorgeous and compares its sound to her early country recordings, noting "This is the stuff that proves that simplicity can really overshadow the flamboyant when given the chance." However, he criticizes the performance of some songs, such as "Hello God" and "Stairway To Heaven," as being too overproduced, lending their sound closer to the songs of the pop era of her career. Read the full review here. Led Zeppelin's Robert Plant, co-writer of "Stairway To Heaven," had been quoted by Dolly as saying he loved her version, and now he has publicly confirmed his thoughts. Plant told Launch.com in a brief published Sunday that he does like her version, adding: "You know, the thing is that she's not wailing--she's keeping it within the genre, and she's a good singer. Maybe she didn't get the last bit properly, and maybe that's sort of how the idioms have changed so much, that maybe it doesn't matter--maybe that's the way to do it." He also said that he understands why some fans may find Dolly doing the song a bit odd but said, "For it to be covered here, there, and everywhere, it doesn't really matter." Read the full story here. A comment Dolly made during her Wednesday concert in New York made Mary Huhn's "High Notes And Low Notes" column in Sunday's New York Post. Under the title "One-Line Wonder," Huhn recounts Dolly's response to fans during her show who offered her a pair of horns, which a few have been wearing at Dolly's public appearances in recognition of the album's title. Dolly joked onstage: "I don't need those horns. I'm horny enough as it is!" Read the full column here. Washington, D.C., residents better get ready for Dolly! Her sold out show at the 9:30 Club takes place Monday night, the second stop on her 13-city summer tour. Get tickets for her remaining dates here! And anyone attending the show who would be willing to send in your report of the concert and photographs, if available, would be greatly appreciated! E-mail me here. Thanks! An astute reader came across what to my knowledge is the first advertisement in a major publication for Dolly's Halos & Horns. In a quarter-page ad in the August issue of Interview magazine, the copy touts: "It's unanimous; Dolly Parton hasn't made music this good in thirty years or more. Since coming to Sugar Hill Records, Dolly has gone back to her roots and recorded some of the finest music of her career. Consumers and critics alike have responded with gushing praise. Surrounding herself in sparkling acoustic settings, Dolly's voice is revealed as an even more amazing instrument than anyone had even dared to imagine. Check SugarHillRecords.com for dates to Dolly's First Tour in 10 years." Thanks, Mike! Music industry paper Variety said "The audience breathed it in hungrily, maintaining a rapt silence through delicate songs like 'Little Sparrow' and hooting unabashedly for party-starters such as 'Orange Blossom Special.'" Read David Sprague's full review on MSNBC here. The New York Daily News said Dolly's earnestness "could melt the heart of Saddam Hussein." The reviewer said the audience received the concert "with an enthusiasm that bordered on hysteria" and that Dolly commented on the concert's large percentage of gay attendees by winking as she said: "There are an awful lot of pretty boys here tonight!" On her voice, he noted "With her lofty pitch and guileless flutter, she can still capture the giddiness of youth." Read the full article here. The New York Post said Dolly's "folksy home-down hoe-down" proved she "is a real woman who's able to express emotion in melody." Although reviewer Dan Aquilante said he couldn't fully appreciate the concert because of its similarity to a media-only show she did last year in New York which he attended, he said her performance was spectacular and almost flawless. Read his story here. Thanks to Gabe for these great pics from Dolly's Virgin Megastore CD signing in New York on Tuesday! The Houston Chronicle on Friday reproduced a Washington Post interview with Dolly about the tour and new album, plus a note that she may do a Broadway revival of Hello, Dolly playing the legendary matchmaker -- with the slight alteration that her "Dolly" would be from the South. The article praises Dolly's wonderful songwriting on the new album and notes that her singing is the best it's been in years. Read it here. Britain's The Guardian on Friday also published an interview with Dolly talking about the album and tour and her life in general, including the note that she plans to soon record a children's album and re-launch her line of cosmetics. Read it here. Sevierville's Mountain Press published an article this week on Democratic gubernatorial candidate Phil Bredesen's plans to take Dolly's Imagination Library program statewide and added news that the United Way chapters in South Dakota have banded together to operate the program statewide there, adding 10 communities to the 63 already participating. The article quoted Bredesen as saying he learned about the program during a campaign stop in Dolly's hometown: "I was fascinated with what Dolly Parton and the foundation has done," he said, adding that the estimated $10 million the program would cost annually statewide as "a cost we can bear." He said "Reading is the key to so much in education. It's something I want to do for every child in the state." Read the full article here. The Myrtle Beach, S.C., newspaper had an interesting article complaining that Dolly, who operates the Dixie Stampede equestrian dinner theater in town, did put the resort community on her tour this summer. Read it here. Manuel has started up a discussion group on Yahoo for Dolly's current national tour. To visit, click here. As has been previously reported here, Dolly will perform in England and Ireland this fall, and the Belfast Telegraph announced in an article on Thursday that two of those dates will be in Ireland -- one in Dublin and a second, which was to be finalized sometime on Thursday, likely in Belfast at either its Waterfront or Odyssey venues. (The article, however, incorrectly said this is the 20th anniversary of "I Will Always Love You," saying she wrote it in 1982. It was actually written and subsequently originally recorded about 30 years ago.) Read the full story here. I've just been informed that The Bourbon Pub (801 Bourbon Street in New Orleans) will be hosting the official "Pre-Dolly Party" the night before her concert in the Big Easy. The event at the predominantly gay Bourbon Street establishment is tentatively scheduled to run from 9 p.m. until 11 p.m. on Sunday, July 28, with Dolly's concert at House of Blues scheduled for the evening of Monday, July 29. More information as plans are finalized. Thanks, Lawrence! Keith Lawrence of the Owensboro Messenger-Inquirer published a review in Kansas' Lawrence Journal-World, saying it's not worth arguing what genre to place the CD in (he notes it's not bluegrass but rather mostly acoustic) and that it is simply "good music." He says the CD "is an hour of Dolly Parton, full of energy and filled with both joy and pain. And it's very personal. She wrote all but two cuts." Read his full review here. Alternative weekly paper the New York Press weighed in with its two cents worth in a somewhat strange column by Crispin Sartwell. In a story largely focused on Kid Rock's affinity for full-figured women and a newcomer in country music named Heather Myles, he said he didn't care for Dolly's two previous roots albums (although he didn't put it that politely), but Halos is different. Aside from noting that her music is stripped-down and natural on this CD (and that the album photos make her look like she's in her mid-30s instead of her true age of 56), he adds that the record shows that "Dolly is still a desperately beautiful singer: fragile and perfect as china. Her melodies are still as distinctive as they were in 1972. And she's quite the lyricist." Read his opinions here. Drag performer and actor RuPaul praised the CD on her site's web log immediately after hearing the CD for the first time, noting: "tonight, i made a special trip over to the virgin mega-store just to get dolly parton's new album called HALOS AND HORNS. i listened to it on the way home and boy ...it's fantastic!!! i'm prayin' i get to see her on her first tour in ten years, when she plays the house of blues here in hollywood. i just hope my back operation doesn't get in the way of me seeing her show. over the years, i've met every star i've ever wanted to meet...all except for dolly. i've spoken to her on the phone before, but never in person. this concert just may be my opportunity. " In the previous entry, she also listed 9 to 5 as her second-favorite film. Visit the site here. Thanks, Christopher! In related news: The CD made it to No. 10 this week on the album chart of indie college station WBAR 87.9 FM in New York City, operated by Barnard College. And the British network Virgin Radio played Dolly's "Stairway To Heaven" on its Captain America show Sunday night. Billboard premiered its new bluegrass albums chart on Thursday, issuing its first edition dated July 20, and Dolly is well-represented. Little Sparrow comes in at No. 13, and Ricky Skaggs And Friends Sing The Songs Of Bill Monroe (which features the awesome "Cry, Cry Darlin'" performed by Dolly) is at No. 11. Although this is the first week that the chart has been published, the CDs were both credited as in their second week (apparently chart figures were tabulated for the previous week but not released publicly). Those wondering where Halos & Horns is should take note that the charts released this week are based on sales figures from before it came out, so the CD should debut in next week's charts, which will be published on Thursday and dated July 27. Although Dolly chose not to run for governor of Tennessee after a few thousand voters signed a petition asking her to throw her hat into the ring for this year's election, her name is popping up in the campaign. The Knoxville News-Sentinel reported Thursday that Democratic candidate Phil Bredesen was at a Knoxville daycare center Wednesday reading books to children and said if elected he wants to establish a public/private partnership to spread Dolly's Imagination Library program of the Dollywood Foundation statewide to more than 375,000 youngsters. The program, which Dolly started several years ago in her native Sevier County, Tenn., has spread nationwide thanks to a $17 million gift from Dolly. Today it operates in more than 63 communities in a 15 states reaching more than 60,000 children monthly. The literacy program provides one free book per month to any child from birth to age 5 living in a participating community. Read the full story here. Although I haven't confirmed if the track listing is the same as the original 1978 RCA album and subsequent 1999 Buddha reissue, RCA and Buddha parent company BMG has announced it will release a CD titled Heartbreaker on July 23 at a price much lower than the version which came out three years ago. Reserve your copy here. The Grand Ole Opry website is asking summer trivia questions for chances to win a picnic basket full of Opry goodies. 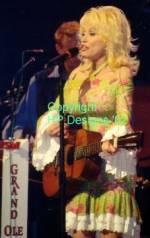 In recognition of Dolly's July 20 Opry appearance, Wednesday's question was what is the name of Dolly's new CD. Try your hand at the contest by visiting www.opry.com. Thanks, Mike! The Washington Post published its review of Halos & Horns on Wednesday, with reviewer Dave McKenna opining: "No use burying the lead: Dolly Parton does 'Stairway to Heaven.' And, dadgummit, the forests won't echo with laughter when her mountain kin hear Dolly get after the Led Zeppelin monster, which closes her new and wonderful record . . . So when Parton gets the Led out, it's not like Pat Boone covering Metallica or Tom Jones doing Prince. Her up-tempo country rendering of 'Stairway' has no more kitsch than the original, which since its 1971 release has served as an anthem to several generations of confused adolescents." He says of "If" that she "speeds it up and makes it her own." He calls the Dolly originals on the CD "further evidence of what Parton fans have long known: banging out catchy country songs comes so easily to her." He says "Sugar Hill" is "a sweet little ditty" and "Not For Me" finds her "Reba-deep in self-pity." He says her own pickers don't let the listener down, as they have a musical prowess comparable with the legends she employed on her previous two bluegrass discs and, happily, that "bluegrass may never be the same again." Read the full review here. Ticketmaster.com on Wednesday added Dolly's Aug. 17 Chicago date to the list of concerts for which it is reporting no tickets available, suggesting the possibility that it, Dallas and New Orleans have joined Washington, New York, Atlanta, Nashville and Los Angeles in selling out (even though an article in Wednesday's Dallas Morning News said the venue there still had about 300 tickets left, which would probably have been the tally as of Monday or Tuesday). Get your tickets to the tour's other five dates here! And Dolly and David Bowie are the Featured Artists Of The Month at most Barnes & Noble stores across the country, where listening stations and special displays are set up promoting the CD. Thanks, Manuel! Dollywood on Wednesday issued a press release promoting its Children's Festival, which runs July 19-21. Among the fun on tap for youngsters: Thomas The Tank Engine with his stage shows, the School House Rock revue, the wood-n-strings puppet show "Backwoods Ramblin'," musical storytellers Suzanne and Jim, the interactive dog stunt show "Paw's For Effect," forest rangers talking about the rainforest and showing reptilian life and a Kids' Karaoke Café, where youngsters can become their own singing stars at Dollywood. Rolling Stone writer Steve Knopper said no matter how one might joke about Dolly doing "Stairway To Heaven," she "remembers Led Zeppelin's burned-out rock-radio classic as a singer's showcase, not a shell for flashy electric guitar playing. Sticking with the understated country and bluegrass of her last two CDs, Parton throws herself into the lyrics, whispering at the beginning and belting like Tammy Wynette by the end." He also notes that she turns "If" into "an effective torch ballad" and proves herself a master interpreter of songs on the CD, including those she wrote herself, particularly pointing to the "beautifully sad" "Not For Me" and "Hello God," in which he says "she articulates our national post-September 11th feeling of 'why?'" Read his full review here. E! Online gives it an "A-," noting the CD is "pick-perfect bluegrass, folk and country" and that it will "charm the chaps off both diehards and the folks who discovered these backwoods sounds because of the O Brother, Where Art Thou? soundtrack." Picked as standouts are "Sugar Hill" and "These Old Bones" as well as "If" and "a touching and worthy remake" of "Stairway To Heaven," both of which the reviewer says "get strokes of new life under Parton's spell." Read it here. USA Today offers it three out of four stars, with Brian Mansfield saying it brings the bluegrass of her two most recent solo albums "full circle" and that the supernatural themes of Dolly originals "Hello God" and "These Old Bones" provide a context in which her gospel remake of "Stairway To Heaven" is "a perfect fit." Read it here. New York Post reviewer Dan Aquilante also gives it three out of four stars, calling it "an odd yet compelling combination of contemporary country, bluegrass and even rock." Read it here. While its story didn't contain any opinion on the CD and provided only a summary of its track listing, CMT.com put the cover as its front page lead art on Tuesday, listing it at the top of its overview of new releases this week. And On The I.com, which contributed to the CD's special features and named Dolly its Featured Artist Of The Month for July, chose to reprint the Dollymania review of the CD as its site's official review. Thanks! Ticketmaster on Tuesday was still showing no tickets available for Dolly's July 29 New Orleans concert or her Aug. 3 Dallas show, suggesting that the first seven dates of her summer tour have sold out. Tickets are still available, however, for the 13-city tour's final six sets. Get them here! Well, it's the big day! Halos & Horns hits stores nationwide, and the critical acclaim continues to pour in! Entertainment Weekly gives it an "A-" and says she "pulls it off, magnificently, thanks to her spectacular trill of a soprano and earnest approach." The full review is here! Thanks, Christopher! New York Magazine writer Ethan Brown says she turns "cutesy sentimentality" and "cliché" into "compelling" music, noting that "few singers are more moving or emotive." He's another critic who praises "Stairway To Heaven," explaining that Dolly's "aching cry and plaintive phrasing" emphasize the song's "quiet bluesiness over its rock-and-roll gradiosity, reviving the reflective power" of the song. He says that her use of a gospel choir could easily make the song "mawkish or camp" in another's hands, but Dolly pulls it off superbly, as he compares it favorably to her guest appearance singing lead vocals on Ladysmith Black Mambazo's cover of "Knockin' On Heaven's Door." He concludes that her "risks here bring great, unexpected pleasures." Read his full review here. Billboard chose the CD as one of its four Hot Products this week which it is featuring on its website here. And while the CD hit streets in Europe on Sanctuary Records Monday (and, apparently, in Canada a week early), it is scheduled for release Down Under on July 27 by Australia's Shock Records, I'm told. Thanks, Sean! On Monday, Ticketmaster.com was still showing no tickets available for the July 29 New Orleans concert, and also on Monday no tickets were available online for the Aug. 3 Dallas show, again suggesting that both of these venues are at or near selling out, as New York, Washington, Atlanta, Los Angeles and Nashville already have done. Better get your tickets fast for all of her remaining summer tour dates here! Dolly also got a mention in Friday's New York Times. In a story on world music, the paper profiled Irish group Altan and its recent album The Blue Idol, on which Dolly performs a duet at what the newspaper calls "her most Celtic." Read the full story here. Sugar Hill Records on Monday posted its ninth weekly preview installment from Halos & Horns, the song "Stairway To Heaven" here. And remember, House of Blues has clips from the entire album on their site here, where you can also enter through July 26 to win the trip to Las Vegas to see Dolly live on Aug. 10, and as has been previously reported here, Netscape is offering a full-length streaming audio version of the album in an online listening party here! For even older news, click here. Sunday's The Dallas Morning News carried a review of Halos & Horns (actually published on the web late Friday night). In giving the CD an "A," Mario Tarradell wrote: "After all these years, Dolly Parton's voice is still like that old log cabin home perched on a hill. It's untouched by the modern world yet holds treasures that would surely enrich everyday lives." He says that the CD "is one of those special records that packs power in its simplicity." As other reviewers have done, he compares it to her timeless recordings of the early-to-mid-'70s and that Dolly "is writing, singing and producing (this album is her debut as sole producer) with so much thought, care and heart." He says she puts "a fresh coat of inspiration" on her covers of "If" and "Stairway To Heaven," also calling her version of the latter song "unforgettable" and "a haunting Southern gospel anthem that chills at every turn." He says "These Old Bones" is "enchanting." Read the full review here and be sure to get your copy of the CD when it hits stores on Tuesday! The Knoxville News-Sentinel gave Halos an "A-" in Wayne Bledsoe's review on Sunday, again comparing it favorably with her early 1970s material and praising Dolly's cover of "Stairway To Heaven" as well as saying her performance on "Dagger Through The Heart" stands out as one of her best vocally in her career. He sums up the album as "another one for the angels." Read his review here and an article he wrote about Dolly's recording of the album (in which it is noted that she recorded 10 additional songs which were not included on the CD -- maybe we'll see them on a subsequent release?) also published on Sunday here. Winnipeg Sun reviewer Darryl Sterdan gives the album four out of five stars, saying "The devil's music never sounded quite so heavenly." He calls the CD "inviting" and says it works on all levels, from the gospel numbers to the "grand bluegrass epic" she makes out of "Stairway To Heaven." Read his review here. And People magazine praises the CD as proof of Dolly's "credibility as an artist," calling it "heaven-sent" and listing its "Bottom Line" as "Hello again, Dolly!" Read their review here. While I haven't officially confirmed this, I've been told by a Canadian reader that the CD was released there by FAB Records a week earlier than anticipated, hitting stores last Tuesday. Thanks, Peter! Dolly's Little Sparrow jumps up two places on the British country albums chart released Sunday, coming in at No. 8 in its 71st week. The Grammy-winning CD peaked at No. 1 for eight weeks last year and reached gold status overseas. I've learned that The Best Little Whorehouse In Texas has finally been released in a format readable on U.S. DVD players. Universal Pictures has issued it under the title La Mejor Casita Del Placer on a multi-region DVD in Mexico. I'm told that the film is in English on the disc, while a Portuguese dub as well as Spanish subtitles are also available. Although I haven't located a retailer yet which is importing it into the U.S., I'm sure it won't be long until you can get it here. As you may recall, it was reported here several months ago that the DVD was released in January in Australia and shortly thereafter in Europe, but neither version had been readable in the U.S.
Don't forget to catch Dolly on David Letterman Monday night and several appearances on the CD's street date Tuesday (CNN's American Morning, ABC's The View and the in-store signing at Virgin Times Square) leading up to Wednesday night's concert in New York! Dolly was spectacular on NBC's Today Friday morning. The audience was very enthusiastic, with some even wearing horns on their heads and others shouting to the show's cast "Where's Dolly? We want Dolly!" Introducing her, they showed clips from an interview she did on the show in 1978, a clip of her performing "My Blue Ridge Mountain Boy" on the Grand Ole Opry, her performance for her induction into the Country Music Hall of Fame, scenes from her films and more. Before performing, she signed a few autographs for the crowd and "jiggled" off-camera to flirt with host Matt Lauer. Wearing a red and white rhinestone-studded floral print dress with fringe, she performed "I'm Gone," even playing the harmonica at the introduction and toward the end (something she rarely does in public). She also sang "9 to 5" and "Halos And Horns," accompanying herself with the band on an acoustic guitar for the final number. Clips of each performance are available for viewing on the show's website here. Virgin Megastore Times Square has posted on its site (here) some information on Dolly's Tuesday afternoon CD signing at their store. Due to time constraints at the two-hour event which starts at 4 p.m., she will sign copies of Halos & Horns purchased at that location only. One must purchase a copy of the CD at the store beginning at 9 a.m. Tuesday to receive a wristband for admittance to the signing. According to the notice, she will not sign anything other than the CDs. Miami Herald reviewer Howard Cohen says the CD (and her two other Sugar Hill bluegrass releases) put her in the rare category with Bob Dylan, Elton John and Willie Nelson as artists who've released the strongest albums of their careers more than 35 years after they started in the music business. In a four-star review titled "Parton proves there's nothing she can't do," he says Halos is better than either The Grass Is Blue or Little Sparrow and harkens back to the most prolific period of her songwriting and recording career, when she was churning out such classics as Coat Of Many Colors. He boasts that "These Old Bones" introduces the listener to a character as alive and interesting as "Applejack" and says "Hello God" is a powerful yet simple composition which he compares positively with Alan Jackson's "Where Were You When The World Stopped Turning." About "Stairway To Heaven," he says it's the album's highlight and biggest surprise as "a gorgeous Southern gospel number . . . she manages to make this overly familiar 31-year-old war horse her own, underlining the poetry in Robert Plant's lyrics and writing a new closing verse to fit her own apocalyptic summation." In closing the review, he predicts it will be very unlikely that any other country album released this year will be better than Dolly's. Read the full review here. British publication The Guardian offered its review of Halos & Horns on Friday, giving the CD four out of five stars. The reviewer noted that the CD "is another fine addition to the latterday Parton catalogue" and called it "lit with powerful emotions, impeccable acoustic musicianship and close-harmony singing that JS Bach wouldn't look down his nose at." Read the full review here. The Bradenton Herald in Florida gives the album a "B+," calling it "a super bunch of bluegrass-tinged originals plus surprising covers." Their two-sentence mini-review is here. CMT.com's question of the day on Friday was which Dolly song do you like best. "9 to 5" was leading as of early Friday evening with 40 percent of the vote, followed by "I Will Always Love You" with 29 percent, "Coat of Many Colors" at 15 percent, "Jolene" at 10 percent and "Shine" at 6 percent. Cast your vote here. Ticketmaster.com as of Friday evening was again showing no tickets available for Dolly's July 29 New Orleans concert, again suggesting that it either has sold out or is very near selling out, as due to the way Ticketmaster's ordering system operates the message can appear when only a handful of tickets are remaining. Get tickets for her tour dates which aren't yet sold out here. Better hurry! Country music historian and CMT editorial director Chet Flippo was so impressed with Halos & Horns (in stores on Tuesday!) that he dedicated his entire weekly column (and CMT.com's Fourth of July lead story) Thursday to Dolly's latest effort in a piece titled "Let Us Now Praise Dolly Parton." Noting that while her covers of "If" and "Stairway To Heaven" are both "good," he raves about the other 12 Dolly-composed cuts on the disc: "Make no mistake about it: this lady is one of the premier songwriters in the music pantheon." He recalled that until her two most recent albums, "she was never really considered an album artist" with records instead comprised largely of "mismatched songs." However, for a third time in a row, he said, she "has firmly re-established herself as a major country artist." He adds: "Her new songs here are a glimpse inside the fervid Parton imagination, a wonderful Parton mix of fairy tales, stories of leaving, ethereal and evocative dirges about broken hearts, visions of apocalypse and rapture, a personal plea to God, childhood memories and vivid mountain folk tales." He calls "These Old Bones" an "instant classic," and "John Daniel" a "saga." He ends with: "She continues to make country music that is fresh and vibrant and very much alive." Read his full column here. CDNow senior editor Drew Wheeler chimed in Thursday with his own review, labeling the CD "unambiguously divine." He raves over her new compositions and re-recordings of older originals, calls "Stairway To Heaven" "lovely" and "clever" and says "If" is "delightfully reedy, cheerily countrified." Alex Steininger offers his thoughts on the CD in the July issue of In Music We Trust, giving the album the grade of "A." He calls the CD "a warm, good natured country record with strong songwriting," adding: "The work of a talented voice hitting her stride and creating one of the best albums of her career, one that is heavily rooted in real Americana and old-time country music, but isn't afraid to go along with the times, sounding equally modern and fresh." He says the songs "carry themselves, with each one a strong collection of fine instrumentation, beautiful lyrics, and Parton's country gal soul running through every song," calling the CD "one of the finest country releases this year." Read his full review here. Not to be left out, Barnes & Noble reviewer David McGee wrote on Thursday: "The big buzz is all about her interpretation of Led Zeppelin's 'Stairway to Heaven,' which evolves from a stately, measured folk song with mystical strains to a boisterous, ad-libbed coda featuring an emotive gospel choir. But the salient points about Halos & Horns are first, that 12 of its 14 songs are powerful Parton originals -- as if anyone needed reminding that she ranks with country's greatest songwriters -- and second, that her vocal performances are as extraordinary as any this veteran artist has laid down in her estimable career . . . In coming full circle to the music she was raised on, Dolly Parton sounds as tuneful and true as ever." And finally for the bad one (the ONLY bad review which I have seen anywhere for this album): Bill Compton of the Sacramento News & Review says the CD has some good cuts, such as "Dagger Through The Heart" (although he called it "Dagger In My Heart") and the title song, but believes the rest of the album falls flat. He calls Dolly's spiritual tunes "insipid," criticizes "These Old Bones" for "mountain culture stereotyping ," and claims that "Stairway to Heaven" starts off nicely but "deteriorates into shrillness and thinness" (he is also the first reviewer to say that he or she didn't adore Dolly's version of the song). Finally, he calls the overall product an "oddity of an album." Read his full awful review here. The only possible explanation for his trashing so eagerly a CD which has been universally received by every other critic out there as amazing, is that guy either has a personal hatred toward Dolly or no appreciation for or understanding whatsoever of good music! New York Magazine gave Dolly a plug this week in its overview of upcoming concerts, profiling her for the sold-out July 10 show at Irving Plaza. Read it here. Don't forget Dolly performs live for NBC's Today summer concert series Friday morning! And then she'll do David Letterman Monday night and several appearances on the CD's street date Tuesday (CNN's American Morning, ABC's The View and the in-store signing at Virgin Times Square) leading up to Wednesday night's concert in New York! As of Wednesday evening, Ticketmaster was showing no tickets available for the July 25 Atlanta show (which House of Blues announced Tuesday morning was sold out, but for which Ticketmaster was still selling tickets on Tuesday night). At the same time, tickets were once again for sale online for the July 29 New Orleans show (which Ticketmaster was showing as no longer available Tuesday night). Get your tickets here! Calgary Sun reviewer Anika Van Wyk published her take on Halos & Horns Wednesday, saying: "It is fantastic to hear Dolly Parton get back to her southern roots. Bluegrass so suits Parton's voice and it's obvious she's comfortable with the traditional tunes. This self-produced album works best when Parton sticks to her roots." Giving it three and a half out of five stars, Wyk says "I'm Gone" is the album's stand-out track. She faults "Hello God" and "These Old Bones" as being "gimmicky," but doesn't comment on "Stairway To Heaven" (which all of the other critics have lavished with praise). On Dolly's self-produced arrangements, she notes that Dolly "has a wonderful style of building songs slowly. Many start with only Parton's voice and a single instrument. As the song continues, other instruments and vocalists join in, giving each song a finale." Read the full review here. Dayton, Ohio, area AM station WBZI has been regularly playing cuts from the CD for the past three weeks, I'm told, especially airing "These Old Bones" quite a bit. Thanks, Kevin! This week's LA Weekly had an interesting Dolly mention in it. In an article (here) about former Creative Artists Agency head Michael Ovitz's alleged homophobia, a reporter recounts a meeting which CAA agents had with Dolly and her then-manager and business partner, openly gay Sandy Gallin. The story says Dolly removed her earrings and necklace, which Gallin promptly put on himself and "vamped" around the room. The other agents enjoyed the humorous moment, laughing until Ovitz walked into the room, causing a dead silence. The story claims that Gallin knew of Ovitz's dislike for gays and "loved to see him squirm." House of Blues announced on its website Tuesday morning that Dolly's July 25 Atlanta concert has officially sold out, but Ticketmaster.com still showed tickets available as of late Tuesday night. (As you may recall being reported here, this show has caused some confusion recently, as Ticketmaster showed no tickets available for several days last week, suggesting it had sold out, but tickets were back on sale later in the week.) Also, Ticketmaster on Tuesday night was showing no tickets available for her July 29 New Orleans show, indicating it has either sold out or gotten down to only a handful of tickets remaining. (Perhaps House of Blues simply put the "sold out" logo on the wrong line, as Atlanta is just above New Orleans on their site?) Previously sold out shows are Washington, Nashville, New York and Los Angeles. Get tickets for the remaining dates in this summer's tour here. Sugar Hill Records and OnTheI.com asked me to pass along that they are featuring Dolly as the Artist of The Month on their site through the end of July. The company worked with the record label on the enhanced CD features for her July 9 release Halos & Horns and will have available on the site exclusive interview footage, tracks from the album and a review from her 930 Club concert in Washington on or around July 17. Also, some give-a-ways are being finalized for the site as well. So click here or on the graphic at left to access it! Thanks, Chip and Rob! Internet browser company Netscape and AOL Music have begun offering access to an "online listening party" for Halos & Horns, offering visitors a streaming audio connection to the entire CD. Take a listen here! (But be advised that the streaming audio lasts for nearly 58 minutes and runs in the order of the CD's track listing.) Thanks, Dan and Julie! CMT Auctions asked me to remind everyone that its charitable auction for the Mary Byron Foundation started Tuesday. Dolly has contributed several items to benefit the organization, whose mission is to support the victims of domestic violence, as was reported here last month. Bids will be accepted through July 14. Several bids had been placed on the first day of the auction, pushing autographed copies of Dolly's albums Jolene, Coat of Many Colors and Best of Dolly Parton up to $40-$50 each, while an autographed acoustic guitar had already neared the $200 mark. Visit the auction here! Tower Records' monthly magazine, Pulse, this week posted its review of Halos & Horns, giving the CD four-and-a-half out of five stars. The review notes: "It's not overstating the case to say that Dolly Parton is the single greatest artist that country music has ever produced." While the reviewer wasn't too fond of "Hello God" or "These Old Bones," he loved "Stairway To Heaven," which has received universal critical acclaim in every review I've found. Commenting on Dolly's gospel-themed arrangement of the rock classic, the reviewer said: "It should be one holy mess, but she actually pulls it off, making it the defining musical statement on this album. To shoot this high and succeed is an amazing achievement for a performer in her fourth decade of making records." About the overall CD, it was noted that this is "the most confident and accomplished" of her three roots-music albums for indie label Sugar Hill, adding: "Message to Parton: Please don't stop now, you're on a roll!" Read the full review here. Rob over at Sugar Hill reports that he saw the video for the album's first single, "Dagger Through The Heart," for the first time Tuesday, saying, "It's very powerful." He described the video as showing Dolly singing into one camera bearing straight hair and wearing a tattered blue jean jacket. Dolly from the waist up and a black background are all one sees, and it ends with Dolly tearing-up ("real tears," he adds). Look for it on CMT when Dolly appears on Most Wanted Live July 20! Thanks, Rob! And the CD is getting more airplay. WFMU, a "freeform" FM station in New York City, aired "Sugar Hill" on its "Inner Ear Detour" program Tuesday, and cuts are showing up on XM Satellite Radio's commercial-free Bluegrass Junction station (XM-14 for subscribers). Billboard Online on Monday named Dolly its "Artist Of The Day," posting here an abbreviated version of a profile which appears in the publication's July 6 issue (which should be on newsstands nationwide Tuesday or Wednesday). In the story, Deborah Evans Price says that the album "continues Parton's excellent trajectory, serving up a set of originals that explores the complexities of the human condition." The article also notes the premiere of the video for the first single, "Dagger Through The Heart," on CMT July 20 but also announces that the video will premiere the same day online via AOL. "I'm just loving having this outlet where I can go back and do what I really love to do -- actually, what I do best," Dolly is quoted in the story. "There just wasn't a market for me for many years. Then I started doing the same music I came out of the Smoky Mountains with, and it's catching on again." It also notes Tim Petersen, country music buyer for the TransWorld record store chain, predicting that Halos & Horns will sell even better than Little Sparrow, which itself is at about 200,000 copies in the U.S. In related news, Billboard just announced that starting with its July 20 chart edition, the magazine will begin publishing a 15-title bluegrass albums chart. Dolly made an appearance on the nationally-syndicated radio program The Bob And Tom Show on Monday. The show has a nice bio on Dolly paired with some great photographs from her in-studio appearance today on their website here (even if they miscount her Grammy total as four instead of seven). Thanks, Greg! The Washington Post on Monday featured a great article on So . . . Graham Norton, the sassy talk show by the out comedian Graham Norton in Britain which premiered with special guest Dolly Monday evening at 11 p.m. Eastern on the cable network BBC America (catch repeats at 2 a.m. Tuesday and 11 p.m. July 12). In "Brit Says The Darndest Things!," writer Tom Shales recaps the first two episodes' of the American debut, which, alas, are edited down from the original 40 minutes to just 22 for U.S. broadcast but which, he said, effectively capture Graham's campy humor. He recalls Dolly being presented with pillows in the shape of huge breasts and her trio performance on the show singing "Islands In The Stream" with a Dolly impersonator and Kenny Rogers impersonator via the telephone. Commenting on Graham's upholstery-like suit, Dolly jokes: "My grandma had a couch just like that," to which the host replies, "Well, probably more people have sat on me." Read the full article here. Launch.com on Monday posted a brief story about Dolly's post-9/11 songwriting, specifically the songs "Color Me America" and "Hello God," although it doesn't include any new information. Read it here. Sunday's New York Times featured an article on the resurgence of bluegrass music, complete with a note that according to the International Bluegrass Music Association, only 900 stations regularly play bluegrass selections, "cramming new material by Dolly Parton, Emmylou Harris and Ricky Skaggs into hourlong specialty shows." Thanks, Bryan! Sugar Hill Records on Monday confirmed that Dolly's originally scheduled appearance on the syndicated Live! With Regis And Kelly for July 9 has been cancelled, as it has been replaced with her appearance on ABC's The View. It was reported here Friday night that Dolly had scheduled an appearance on The View, which would apparently replace the Regis stop. Thanks, Rob! The label on Monday evening also posted its eighth Halos preview, Dolly's cover of Bread's "If." Take a listen here! In a review published Saturday under the title "Holy moly, Dolly!," Edmonton Sun critic Fish Griwkowsky praised Halos & Horns, giving the CD four out of five stars. In an entertaining gimmick, he wrote the review as a letter to Sigmund Freud about his love for Dolly. He calls the album "candy mountain of bluegrass beauty and spiritual pondering," adding: "Who but Dolly Parton could get away with a country gospel Stairway to Heaven? She even put it at the end of the album, just like Zep did . . . The song itself isn't quite perfect, but it's holy close. And it cleverly fits the religious theme that streams through the record like a liquid string of levitating sacramental wine." He calls "Hello God" the best song on the CD, calling it "mighty strong . . . pretty ponderous stuff, sung with a begging passion," and says "If" is even better than her cover of "Shine." He doesn't too much like "These Old Bones," calling it "a little hokey," but closes with: "The album is wonderful otherwise. Sugar Hill is a fine party song, What a Heartache a real weeper, and, like I said, Stairway to Heaven. Yes!" Read his full review here. Dolly's Little Sparrow remains steady on the British country albums chart released Sunday, coming in at No. 10 in its 70th week. The Grammy-winning CD peaked at No. 1 for eight weeks last year and reached gold status overseas. Sugar Hill Records should soon add its eighth weekly preview installment from Halos & Horns here (but House of Blues has clips from the entire album on their site here, where you can also enter through July 26 to win the trip to Las Vegas to see Dolly live on Aug. 10)! Gospel legend Dottie Rambo last week appeared on the TBN network, performing a solo version of "Stand By The River" and being interviewed. In her interview, she spoke very highly of Dolly, who has been her friend since the late 1960s, and announced that her new CD, which it has previously been reported here will include a duet with Dolly on "Stand By The River," will be released in September. She also recently appeared on the syndicated program Nashville Gospel and spoke of the duet as well. Dolly and Dollywood had a few mentions in Pittsburgh Post Gazette food editor Suzanne Martison's column Sunday about East Tennessee, where she is originally from. Read it here.